As an early holiday gift to everyone, here is the December 24, 1949 broadcast of THE JUDY CANOVA SHOW from a direct disc transfer. And the best part? Hopalong Cassidy meets Judy Canova! 1949 was a busy year for Canova. She turned down an offer to perform in a traveling circus but made a large number of public appearances on stage, nudged producer Joe Rines into taping her radio program in advance (rather than broadcast live), signed a deal with Simon & Schuster to publish the biography of famous relatives to be titled, "A Collection of Canovas," played on stage at the Iowa State Fair in Des Moines, broke records at the El Cajon Country Fair in San Diego, was mulling over plans for a kiddie album for Decca Records for which she would sing and narrate, and in November she was talking with the Ted Bates Agency regarding making the transition from radio to television in the coming season. Her radio program was cancelled officially in June of 1949 by Colgate-Palmolive-Peet as a result of the sponsor's insistence that television provided a platform for better promotion, and with the belief that Canova was more of a visual act, but in July she agreed to a renewal for a weekly budget of $8,500. Prior to that her program cost $11,500 per week. Canova realized that without weekly exposure her motion-pictures (including movies being re-issued in theaters courtesy of Republic Pictures) would have less draw appeal. This required Canova to strike deals with Hollywood actors in lieu of a performance fee, helping to maintain budget control. In early December 1949, William Boyd agreed to appear as a guest on her weekly radio program. 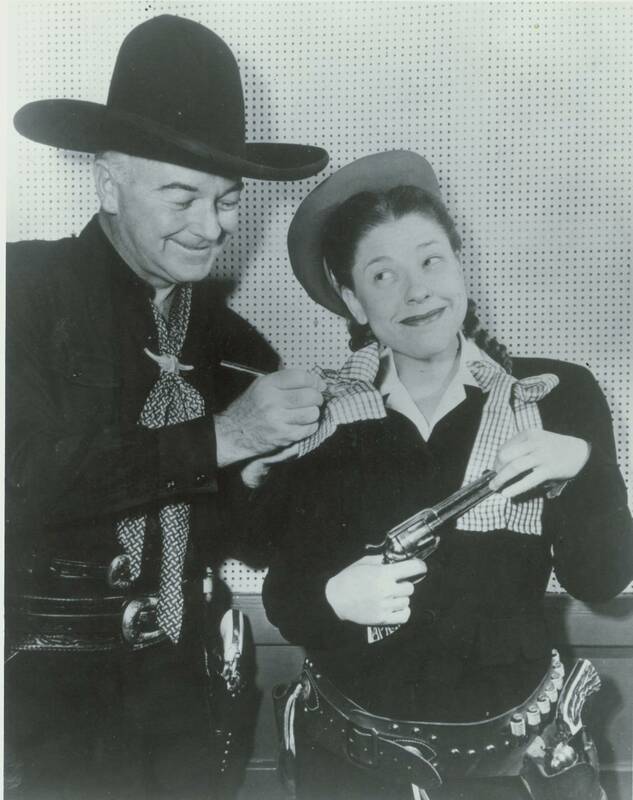 Boyd had recently invested his own funds to produce a weekly syndicated radio program of Hopalong Cassidy and the actor wanted to cross-promote through celebrity guest appearances. But then something happened... Behind the scenes Canova's office was besieged with ticket requests, mostly from youngsters. This put her into a tough spot since NBC would not allow children under 14 to enter the studio and view the show. I have not been able to find anything pertaining to whether or not NBC granted an exception but try to hear the sounds of children in the audience when you listen to the broadcast. In case someone is curious about the count: there is an official list of 78 episodes of The Judy Canova Show known to exist in collector hands, while seven additional episodes supposedly exist. I say "supposedly" because every couple years the broadcast dates for those seven recordings, including this Christmas Eve 1949 broadcast, were made public and multiple people crawl out of the woodwork claiming they have a copy. Multiple people provided a photo image of the disc label, but never provided a recording for various reasons: "No one wants to listen to Judy Canova these days..." or "My asking price is $800 if you want to hear the recording." I doubt Canova's name was the motif behind the ransom prices, but rather William Boyd's continued appeal to baby boomers. When half a dozen people over the years claim to have a recording but no one is willing to prove it, we have to take such claims with a grain of salt. Anyway, about a year ago a transcription disc was put for auction and noticing it was the Holy Grail of the seven "supposedly existing" episodes, with no hesitation I bought the disc and had a friend do the transfer to digital. Now the official count is 79. Thanks for posting the Canova show. That was generous of you. Judy's show wasn't THE JACK BENNY PROGRAM, but it is amusing and makes for pleasant listening. I guess she is so little known these days because her movies have been out of circulation for years, and because she seems to have not done much television work. The BROADCASTING magazine of April 7, 1952 notes on page 96 that she was completing a TV pilot at Republic Studios for NBC, which featured Mel Blanc and Franklin Pangborn and was being directed by Del Lord, best remembered for directing some of the Three Stooges best shorts back in the 1930s and '40s. That pilot sounds like it would be interesting to see. The BROADCASTING of June 10, 1957 mentions on page 59 that she had completed a pilot for a filmed series titled THE JUDY CANOVA CARAVAN. Thanks for the early Christmas gift, Martin. As Toby already said in the other comment, that was very generous of you. At one of the Friends of Old-Time Radio conventions I attended there was a vendor who claimed to own this recording. I paid him for an audio cassette and one year later at the same show I asked 'where is my cassette?' A year passed by and I never received my cassette. He gave me my money back and said the guy he was supposed to get his copy from never provided. He lived in New Jersey. I think he said the vendor was in California who was hoarding the recording. So yes, I heard this existed years ago but never heard it until now. Thanks you! Thanks so much for making this show available, Martin. Enjoyed it a lot. Canova, Hoppy and Christmas... I knew that would make a good combination. It's always a pleasure to hear Mel Blanc, Sheldon Leonard, and Jane Morgan once again. Thanks for making this available!